Welcome and Good Afternoon. Last year we marked our 50th anniversary by celebrating the wisdom of our founders, recommitting to the service we provide, and enjoying some good times as we remembered our past. In our first 50 years, SIUE has transitioned from a branch campus to an independent University proud to be a member of the Southern Illinois University system. We have transitioned from an emerging Metropolitan University to a premier Metropolitan University. And we have transitioned from a "best kept secret" to a University with a growing national reputation based on accomplishment and justified Cougar Pride. I believe the next transition in the development of our University should be that we take a leadership role as a model teacher-scholar comprehensive master's institution in higher education. SIUE continues to develop as a first-tier, first-choice destination school for many Illinois and Metropolitan area families. Freshman applications for fall 2008 were up from all Illinois regions, including the Metro East, Springfield and Chicago, as well as from Missouri. Our freshman applications increased by nearly 10 percent from fall 2007, with almost 8,000 applications received. From those applicants we enrolled 1,922 freshmen, the largest freshman class at SIUE since official recording began in 1976, with an average ACT of 22.64. Since 2004 our freshman class has increased by nearly 200 students from 1,723 to 1,922, filling our new residence facility Evergreen Hall, while raising the ACT of the class by more than 0.3 of a point. Comparing the fall 2004 entering class to the 2008 class, we enrolled 133 more students who scored 25 or greater on the ACT. In fact, 571 freshmen - 30 percent of this class - scored 25 or greater on the ACT, constituting a 5 percent increase in this high-achieving student population since 2004. And this remarkable freshman class reflects our commitment to diversity. Our 2008 freshman class has the largest number of African American students since 1998 and the largest number of Hispanic students ever. Our graduate student enrollment this fall at 2,113 represents an increase of about 4 percent over last year. That number of graduate students is almost the same as we enrolled in 2006, suggesting that our efforts to increase graduate student enrollment are beginning to produce results. Including our professional schools, fall 2008 enrollment stands at 13,602 students; yet the University maintained a 16-1 student-faculty ratio. At this time I would like to recognize our Assistant Vice Chancellor for Enrollment Management, Scott Belobrajdic, our Director of Admissions, Todd Burrell, and their admissions and support staffs for their great work. With a significant population of high achieving students on this campus, we are pleased to report that we have quality places for them to reside. The Carnegie Commission on Higher Education continues to classify SIUE as a primarily residential university. About 3,500 students live on campus, with another 2,100 living within 5 miles of campus and 3,900 living within 10 miles of campus. Many of these students have relocated to the area for the sole purpose of attending SIUE. We have realized great progress over the last 10 years with a 79 percent increase in the number of students living on campus; a 43 percent increase in the number of student organizations; a 185 percent increase in Campus Activity Board events, and a 205 percent increase in estimated attendance at events. These facts demonstrate unequivocally that we are a full-time, primarily residential university. In recognition of the quality of our students, we are pleased to have in the audience today Chancellor's Scholars and Presidential Scholars from our Meridian Scholars Program, as well as some of our departmental scholars. Would the scholarship recipients in the audience please stand and be recognized? With these scholars present, it is my great pleasure to announce that, for fall 2009 SIUE will introduce a multi-faceted scholarship program designed to offer both merit and need-based financial assistance to 310 new freshmen and transfer students. Our newly developed E Guarantee scholarship program is designed to assist new students who have unmet financial need after taking advantage of all federal and state financial aid programs. Under the E Guarantee program, SIUE will meet the remaining financial need for those who qualify. Our prestigious Meridian Scholars program will continue to attract the best and brightest from the region through a competitive process offering a combined total of 20 full scholarships. And the highly competitive, newly developed Cougar Pride scholarship will join with the Johnetta Haley scholarship program to award $2,000 to 210 new freshmen and transfer students who have outstanding records of academic achievement. In addition to these scholarship programs, we will initiate a Geographical Enhancement Program, assigning a special tuition for high achieving and talented out-of-state students. As freshmen they will be charged 1.2 times the in-state rate, in contrast to the 2.5 times we have been charging. Our new multi-tiered approach to scholarships and our new Geographical Enhancement Program are designed to provide high achieving students who are admitted to SIUE the financial resources to attend. These programs will increase the numbers of excellent students attending SIUE, adding to an academically well-prepared, diverse freshman class, characteristic of a premier metropolitan University. In 2004 I spoke to you about claiming status as a premier Metropolitan University as written in our vision statement. I also challenged us to focus on the outcome of the vision statement: national recognition for what we do! As 2009 approaches, we are being recognized nationally for the excellence of our programs and our development of professional and community leaders. For the fourth consecutive year, SIUE has been recognized in the latest edition of U.S.News & World Report America's Best Colleges for the Senior Assignment Program, our integrative learning experience required of all seniors prior to graduation. The senior assignment program ensures that our students have real world and insightful disciplinary experience when they graduate and, thus, have an advantage upon entering the competitive job market or graduate or professional schools. SIUE continues to be listed in the senior capstone experience category along with 16 other universities including Yale, Harvard, MIT and Princeton. And U.S.News & World Report lists SIUE among the top 10 public universities in the Midwest-Master's category for the second consecutive year. SIUE also is listed in the top one-third of all public and private Midwestern universities. And our School of Business is featured in the Princeton Review's "Best 296 Business Schools: 2009 edition." During the past year, the University received reaccreditation by the Higher Learning Commission of the North Central Association through its Academic Quality Improvement Plan known as AQIP. We also joined a number of other American Association of State Colleges and Universities (AASCU) and members of the National Association of State Universities and Land Grant Colleges (NASULGC) to become early adopters in the Voluntary System of Accountability program. Finally, in fiscal year 08, faculty and staff received more than $27 million in externally sponsored grants and contracts for research, teaching and service, placing us among the top 20 Masters-granting institutions in the U.S. for research and development expenditures, as reported by the National Science Foundation. Our vision for national recognition begins with the development of solid citizens who graduate from this institution wiser than when they arrived, inspired to engage in public service, enlivened with a passion for culture, the arts and life-long learning and committed to a better world. Consistent with our vision, we produce exceptional leaders-leaders like Pat Mercurio, who earned a bachelor's in philosophy in 1972. Today she is the president of Bank of America in Missouri. Leaders like Fernando Aguirre, a 1980 SIUE graduate with a Bachelor of Science in business administration and former Cougar baseball team leader. Today he is the successful chairman and CEO of Chiquita Brands International. 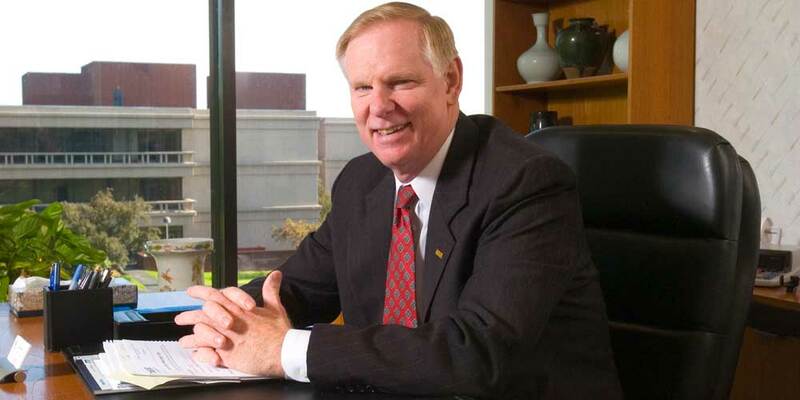 And we've graduated leaders like Ralph Korte, a 1968 alumnus from our School of Business, who is Chairman of the Board of the Korte Company, the company he started in 1958 that has completed more than 1,800 construction projects across the nation. Of the nearly 80,000 SIUE alumni, almost half live and work in the St. Louis Metropolitan area and contribute to the economy. SIUE is the fourth largest employer in Madison and St. Clair Counties, with more than 2,300 full-time employees, and we contribute significantly to the employment base in the Greater St. Louis area. As I have reported before, an economic impact study released in fiscal year 2005 placed SIUE's total regional economic impact at $356 million. For every state tax dollar the institution receives, it generates $5 total spending in the local economy. More than 100,000 visitors annually attend SIUE sporting events, conferences, and performances or visit our students on campus, adding 43 million dollars to the local economy. A unique feature of our campus is University Park, a research and business park established to promote economic development. The Park, which is the home of the National Corn-to-Ethanol Research Center, has been instrumental in strengthening our local and regional economy, as well as providing an excellent training ground for our students. There is a reciprocal relationship between our faculty and business and industry groups in the Park and in the region. Faculty offer expertise through University-based units, such as the Small Business Development Center, the Entrepreneurship Center, the Southwestern Illinois Advanced Manufacturing Center and the International Trade Center. We take great pride in the fact that the Park was selected by the American Red Cross to house its brand new, state-of-the art, 170,000-square-foot centralized blood manufacturing and testing facility in 2011. The center is expected to open on 15 acres and will bring more than 500 jobs to the region, as well as an annual payroll of more than $25 million. The Edwardsville campus wouldn't be what it is today if it weren't for the campuses in East St. Louis and Alton, where our classes first were taught more than 50 years ago. Both campuses add to our national recognition and to our relevance as an institution that shapes the future of our region and beyond. The SIUE East St. Louis Center annually improves the lives of more than 8,000 individuals and families in East St. Louis and surrounding urban communities through its many services and programs. Each year through the SIU School of Dental Medicine, nearly 400 dental professionals volunteer their time and services, providing about $40,000 worth of dental care to nearly 200 area children, at no cost to parents. There have been many exciting developments over the last year involving our faculty, students and staff. I cannot acknowledge them all today, but I would like to mention a few. Rick Yakimo, assistant professor of primary care-health systems in the School of Nursing, was recently elected a Distinguished Practitioner in the National Academies of Practice in Nursing. Jerry Weinberg, associate professor of computer science in the School of Engineering, and his student robotics team, took first place at the International Beyond Botball competition in Honolulu, Hawaii. Caroline Pryor and Susan Breck, both professors in Curriculum and Instruction in the School of Education, were awarded a Landmarks of American History and Culture grant from the National Endowment for the Humanities. In addition, the College of Arts and Sciences received a grant from the National Institutes of Health for Faith Liebl, assistant professor of biological sciences, who will work with students on a project involving brain cell communication. Dr. Yakimo, Dr. Weinberg, Dr. Pryor, Dr. Breck, and Dr. Liebl, please stand and be recognized. And there is much more to recognize and applaud: The Illinois Children's Healthcare Foundation (ILCHF) awarded $1.5 million to the SIU School of Dental Medicine in Alton as part of an initiative to make oral health care more accessible to children in the state of Illinois. Diana Jason, a member of the first class that will graduate from our School of Pharmacy in 2009, competed against all pharmacy schools in the nation and finished as a runner-up at the American Pharmacists Association Patient Counseling Competition in San Diego. And Bryan Kress, a senior accounting major in the School of Business and vice president of Student Government, was recently recognized by StartUpNation.com as one of "a new breed of entrepreneurs that work to make a difference in people's lives" for his top 20 ranked Dorm-Based Business Note2Home.com. Our staff is also being recognized nationally for their continued commitment to excellence. Michael Schultz, director of university housing, is president-elect of the Association of College and University Housing Officers International. Josephine Barnes, director of the Office of Research and Projects in the Graduate School, recently was named a recipient of the Distinguished Service Award from the National Council of University Research Administrators. The University, through the efforts of Bob Washburn, director of facilities management, and his staff recently was recognized in Who's Who in the Building Market through the nationally published Buildings magazine. And the recipient of the October Employee Recognition award is Dee Dee Klein, office support specialist in the School of Pharmacy, who represents the great work of all of our staff. Will Diana Jason, Bryan Kress, Mike Schultz, Jo Barnes, Bob Washburn and Dee Dee Klein please stand and be recognized? Our quest to define excellence through institutional leadership begins with initiatives to improve our retention and graduation rates. Last year in my report to the University, I noted that the SIUE six-year graduation rate of 45 percent was the lowest among the top ten public institutions in our category in U.S.News and World Report. This past summer, our Springboard program was modified to an overnight program, to allow our admissions professionals to spend more time with students during the critical orientation and registration period. Our Provost, Dr. Paul Ferguson, working with a Task Force announced during this presentation last year, has also designed a new Academic Advancement Center that will consolidate under one reporting structure the offices of Academic Advising, Student Opportunities for Academic Results (SOAR), Instructional Services, the Freshman Seminar, the General Education program, and the Honors Scholar program. Under this structure, Academic Advising will become a University-wide program with professional advisors in all of the schools and the College of Arts and Sciences. By fall 2010, all students will have their progress-to-degree tracked by advisors whose sole responsibility will be to work with students to ensure graduation, thus enabling more time for faculty to serve as mentors. As the academic preparedness of our freshman class continues to improve, we will transition from offering proficiency courses to providing tutoring and academic support services. The close interaction of the New Freshman Seminar program with the General Education program, coordinated by a soon- to-be-appointed Director of General Education, should allow greater program transparency for both students and faculty. To meet the significant and pressing unmet needs of an academically prepared group of students in good standing who do not qualify for the competitive admissions standards required by some of our University programs, two new baccalaureate degree programs are being considered: a Bachelor of General Studies degree; and a Health Sciences degree to provide another career option for students who do not enter the Dental, Nursing or Pharmacy schools. The Academic Advancement Center will be directed by Associate Provost Sue Thomas and its principal functions will be located in the new Student Success Center addition to the Morris University Center. The Student Success Center, championed by Vice Chancellor for Student Affairs Dr. Narbeth Emmanuel, also will house other services and centers that will contribute to the retention and graduation of students. International Student Services, Health and Counseling Services, Disability Support Services, Student Government, and the Career Development Center will also be located there. The professional staffs from Student Affairs and Academic Affairs are committed to work together to create synergies contributing to student success, making our new Student Success Center a model for other universities to follow. And speaking of synergies, we will continue our work with Lewis and Clark Community College and Southwestern Illinois College, with whom we have reciprocal agreements, to admit transfer students prepared to complete an SIUE degree. There are other ways we define excellence through institutional leadership to provide students stronger linkages to the university. Our Freshman Seminar courses include a component that emphasizes the culture and values of SIUE. This common experience assists in imprinting students with what is uniquely characteristic of SIUE. Signature SIUE programs such as the Undergraduate Research Academy, Senior Assignment and Academic Program Review also will be further expanded to increase faculty-student interaction. The University Planning and Budget Council has approved a proposal to expand opportunities for undergraduate research by modifying the Undergraduate Research Academy (URA) to create the Undergraduate Research and Creative Activities Program (URCAP.) The URCAP program will offer more than 160 research and creative activities positions per year for students starting at $1,000 per semester to work with faculty in research and creative activities across the University. We will make $200,000 available per year for this program. Since its inception 18 years ago, 285 students have participated in the URA. URCAP would surpass that number in just the next 2 years of its operation. In addition, to advance our Senior Assignment program, we will add $75,000 per year to support additional innovative and cutting-edge approaches to the Senior Capstone experience. Finally, we will add support for Academic Program Review to ensure our faculty is fully informed regarding advances in curriculum in their disciplines. As part of our creative marketing efforts, last spring we unveiled the Faculty Excellence Campaign, featuring nine representative faculty exemplifying excellence in the teacher-scholar model at SIUE. These depictions of faculty members reflect their diversity of thought, backgrounds, teaching, research and service approaches. You may have already seen them in newspapers and magazines, and on billboards going to and coming from St. Louis. And you will see others in the months to come. Another 50 faculty members in this campaign are featured through the Provost's Web site. Our initiative to define the teacher/scholar model for SIUE will enable a clearer representation of who we are as a University, not an aspiration of what we will be. Students desire to learn from highly skilled disciplinary professionals who use their knowledge to inform their teaching. Focusing on the faculty as a means of characterizing our University is an important method for communicating our excellent programs. But, as we have grown in enrollment, needs for additional faculty have been created in some programs. Today, I am announcing that we are creating nine new faculty lines for fall 2009 in the College of Arts & Sciences, and in Health Sciences, as well as the schools of Nursing, Education and Engineering. In 2004 we employed 518 full-time faculty. This fall we have 596 full time faculty. And next year we will have more! With respect to existing faculty, we distributed $610,000 last year for salary equity. I am committed to work with the UPBC to again identify resources for faculty salary equity. Academics is just one area where we expect to lead. Another is in our physical plant and support services. Earlier this semester, I held a reception to recognize the 180 staff members who worked so hard over the last three years to implement our Banner Student and Banner Human Resources systems. Their hard work has transformed the way we register and process student needs and manage employee information for the University. And their work will continue as we implement the Luminis portal which will provide secure and personalized access to the University's web-based resources. The consolidation of the Office of Information Technology and Academic Computing to form Information Technology Services under the direction of Acting Chief Information Officer Jennifer Vandever will enable us to lead in providing computer services to all areas of the University community. To restore our leadership role in providing post-baccalaureate programs for professionals in the region, we will expand our summer part-time and on-line campus offerings under the direction of the Educational Outreach Office instituted last year and directed by Roger Maclean. Will Jennifer Vandever, those present from IT Services and Roger Maclean please stand and be recognized? SIUE is in the midst of its largest building phase since the initial construction of the campus began in 1963. The renovation of the Vadalabene Center gymnasium will be complete in December. The project will replace a bleacher system that is more than 20 years old and make way for additional office, classroom and storage space. Other construction projects recently or soon to be completed include the Student Success Center and the Student Fitness Center; the renovations of Korte Stadium, the Environmental Resource Training Center, the School of Dental Medicine's dispensing and sterilization area, the University Center Bookstore; the creation of a secondary computer center; and the renovation and expansion of the Early Childhood Center. You may also have noticed restrooms being renovated, as well as other improvements in the buildings where you work. In fact, for the five-year period from summer 2004 to summer 2009, we will have completed $130 million of infrastructure renovations and building projects. We also remain vigilant in our quest for a new Science Building that we trust will soon be funded through a state capital bill. Vice Chancellor Kenn Neher has recently formed a Sustainability Advisory Group to address environmental and other issues. Initiatives endorsed to date include: the implementation of a sustainability audit; the signing of the Illinois Sustainable University Compact; the purchase of a portion of electricity from green sources; the investigation of a multi-university wind power project; and the establishment of a natural runoff demonstration site. Additionally, "green" construction practices are being incorporated into all University capital projects. A Safety and Security Task Force composed of faculty, staff and students also has been formed to do all we can to meet and maintain the historical safety levels of our campus. As part of our quest for institutional leadership, we have initiated a capital campaign designed to garner private philanthropic support for student scholarships, endowed faculty positions, and other faculty, student and University activities. Since July 2007 we have received approximately $10 million in gifts and pledges for this campaign. To demonstrate to external donors that we believe in our own work and that we will contribute to it financially, we have also created SIUeDay. While results of our third SIUeDay are still being tallied, from July 1 to October 10 of this year, we raised $132,569 in gifts and pledges from faculty and staff. This is a 26 percent increase in support compared with the same time period for the first SIUeDay in 2006. You, our faculty and staff, are the ones who make this possible each year and the students are the ones who benefit from your efforts. Under the capable leadership of our new Vice Chancellor for University Relations Patrick Hundley, we expect to reach new heights in support of SIUE. Patrick, will you please stand and be recognized. It is essential that we develop our resource base and rise to the challenge of our bold vision. And speaking of rising to the challenge, we are now an NCAA Division I institution. Everybody knows that the Cougars are rising! High-quality academics have made it possible for SIUE to take a major step in securing its place in the national arena. Now in order to compete and be recognized at the highest levels in all areas of the University, as an NCAA Division I institution, SIUE has become the 11th member of the Ohio Valley Conference. The St. Louis metro area includes more than 30,000 alumni of Ohio Valley Conference schools, a number that increases to more than 70,000 when SIUE alumni numbers are included. Securing a place in the OVC is an institutional accomplishment, not just an athletic one! This affiliation will allow our athletes to compete at Division I while staying as close to home as possible to keep their primary focus on studying and meeting their academic obligations. Last year the six-year graduation rate for our athletes was 77 percent, and we expect our high academic standards will continue as a DI institution. The new initiatives I have announced here today have emerged, like our senior assignment 20 years ago, from faculty working with staff and administrators in a collegial environment. Faculty Senate President Duff Wrobbel and Provost Paul Ferguson recently reported to the Board of Trustees on the "Survey of SIUE Faculty Attitudes" administered by the UCLA Higher Education Research Institute in 2007. This survey completed every three years, measures faculty attitudes regarding general academic and institutional-specific issues. In the area of shared governance, SIUE faculty reported that the Faculty Senate played a more important role at the University than had been reported at SIUE in 2004. The percentages of SIUE faculty indicating that administration procedures are both open to faculty input and consider faculty concerns were twice that of the other institutions surveyed nationally. I have said since I joined SIUE that our sense of community is one of our strongest cultural attributes. It is that sense of community that is instilled in our five values of wisdom, openness, integrity, citizenship and excellence. It will be that sense of community that will enable us to emerge as a leader in higher education. Our record of service and accomplishment, whether by faculty, staff or students and whether recognized individually, by program, by department or as an institution follows from our mission, vision, values and long-range goals. Our mission of providing excellent undergraduate and complementary graduate and professional programs, our vision of national recognition for the excellence of our programs and development of professional and community leaders, our long-range goal of striving for excellence, and our university value of excellence all share a common emphasis. Excellence for being the best that we can be. Excellence that comes from doing the right things well. In the words of Aristotle: "We are what we repeatedly do. Excellence, then, is not an act, but a habit." Earlier I spoke of our 50th Anniversary celebration. The culminating event occurred in June, when we placed memorabilia in a vault in Rendleman Hall that will not be opened until our 100th Anniversary. In it I placed a note emphasizing two things: our sense of community and our University values. I completed my message by writing these words: "I trust the SIUE community members of 2058 find this university and this region to be as great a place to live, learn and work as it has been these last 50 years!" To ensure that future let us all commit to defining excellence through institutional leadership! Go Big E! Go Cougars! Material for SIUE news items has been taken from SIUE Public Affairs news releases and other media sources.